As you might expect, prepare the beer batter, dip the salmon strips (don't cut them too thin or they'll be dry) in the batter and then in the mixture of coconut & panko (40% coconut, 60% panko roughly). 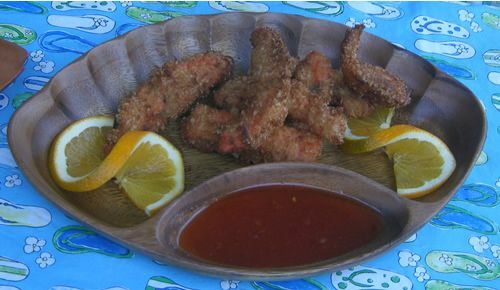 Heat peanut oil in your deep fryer to 360 degrees or light olive oil in a wok until panko crumbs fry on the spot. Now, be very careful, because this fish will cook fast! Put one piece in to test the oil further, if it fries nice & golden brown in less than 2 minutes you're on target, if longer or if it bursts into flames, adjust the temp. I'll generally cook 8-10 pieces at a time in our deep fryer with a regulated temperature around 360. They'll crisp up beautifully and disappear before you can say "Kop Kun" (Thank You in Thai). That's okay, you can always go catch more, right??! !